Bayer MaterialScience says two of its processes are among the finalists for the German Innovation Prize for Climate and the Environment.The first nominee is a technology that requires vastly less energy for the production of chlorine, an important basic chemical. The other finalist is a method for using CO2 for the production of plastics, thus conserving petroleum. 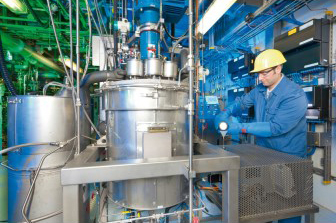 The nominated method for the production of chlorine reduces the very large amount of energy required to obtain the basic chemical by as much as 30% versus conventional processes, says Bayer. Its widespread use would enable economically significant energy savings.Chlorine is a primary base material in the chemical industry and is needed for around two-thirds of all its products, including plastics, medicines and crop protection agents. The new oxygen depolarized cathode (ODC) technology was developed by Bayer in collaboration with ThyssenKrupp Uhde/UHDENORA. It was recently made available worldwide following successful testing.The other finalist is a method for using the greenhouse gas CO2 for the production of high quality plastics. The CO2 replaces a portion of the fossil fuels, such as petroleum, on which these materials have predominantly been based in the past. Bayer wrapped up the corresponding research this past summer. The company plans to launch the first CO2-based products as from 2015.According to the organizers, the German Ministry for Education and Research and the Federation of German Industry (BDI), the objectives of the competition are twofold: to expand on Germany’s leading role in the areas of climate protection, environmental protection and resource conservation, and to strengthen and honor industry’s commitment thereto. At the same time, the prize is also intended to heighten public awareness of pressing climate and environmental protection issues.The awards in five categories will be presented in Berlin, Germany on December 3. A total of 15 sustainable product and process innovations have made it to the final round. They were chosen from among 97 entries by a jury of experts from industry, academia, the media and government chaired by Klaus Töpfer, the former Executive Director of the United Nations Environment Programme (UNEP) and German Environment Minister.